The Ectoplasm Jelly Bomb was the last of the Summit 2017 products that I really wanted but have only just now got hold of. Since the Summit it has had a slight update, it now has a ghost shape on it much like all of the other brand new jelly bombs’ unique mascots, for example Snow Fairy has a star and Dark Arts has an eye. As far as I am aware the Ectoplasm was the first of the jelly bombs to be finalised and released (albeit at the Summit). With it only being available for one day out of the 2 Lush-Summit-days, it meant that only a small handful of people had the privilege of trying it. Therefore when the aforementioned Dark Arts alongside the Marmalade, Green Coconut and The Big Sleep jelly bombs were released earlier this year the Lush world wondered where Ectoplasm had gone. The second time Ectoplasm became available was via the Lush Kitchen a few weeks back, although nothing has been confirmed I suspect it will become available everywhere for Halloween 2017. The Ectoplasm jelly bomb is jam packed with uplifting citrus ingredients, fortunately its scent is nothing like that of the Marmalade jelly bomb, this pleased me immensely as sadly the Marmalade jelly bomb isn’t a product I enjoy purely on the grounds of its scent. Ectoplasm contains tangerine, grapefruit and litsea cubeba oil (an ingredient that was unfamiliar to me), at first I was a little puzzled as when sniffing Ectoplasm I could only really make out a lemon scent, after having a quick look at its ingredients I worked out that this is because of the litsea cubeba oil. Ectoplasm’s scent is a very gentle zest and packs a subtle sharpness, just the right amount of lemony-freshness to help lift and refresh your spirits. 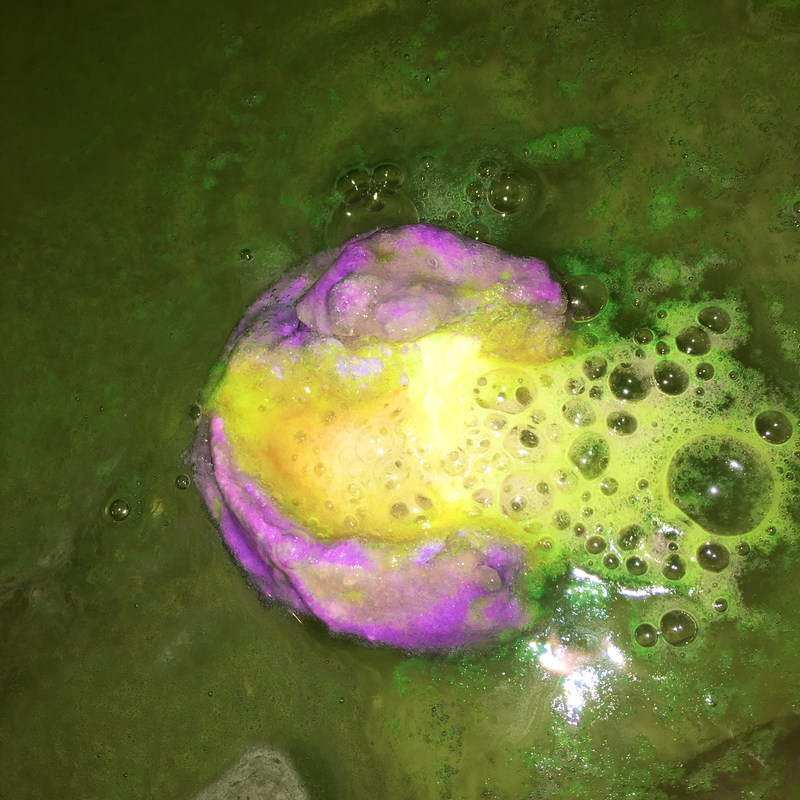 Upon hitting the water the Ectoplasm jelly bomb begins to bob around hissing out a burst of fluorescent green colour, the bubbles fizzing out of it are at first purple tinted but slowly turn the same green. Its green and purple colouring reminds me of the old version of the Northern Lights bath bomb. The bubbles merge together on the surface of the water and slowly froth into a thin layer of jelly. I use the word ‘jelly’ loseley as it’s not gooey at all, it’s more of a silky luminous froth. Upon first use I was a little disappointed that the Ectoplasm didn’t produce more ‘jelly’, after all it is a jelly bomb. I have since tried it again though and on the other occasions it did have more jelly, therefore I advise that it’s worth giving Ectoplasm a few goes before you decide if you like it or not. I suspect the ghost motif was inspired by the colour of the jelly, if you’ve ever seen the 80’s movie Ghostbusters then you’d know exactly what I mean! It much like the Snow Fairy jelly bomb took a while to dissolve. Some of it was in fact still floating around when I needed to get out. 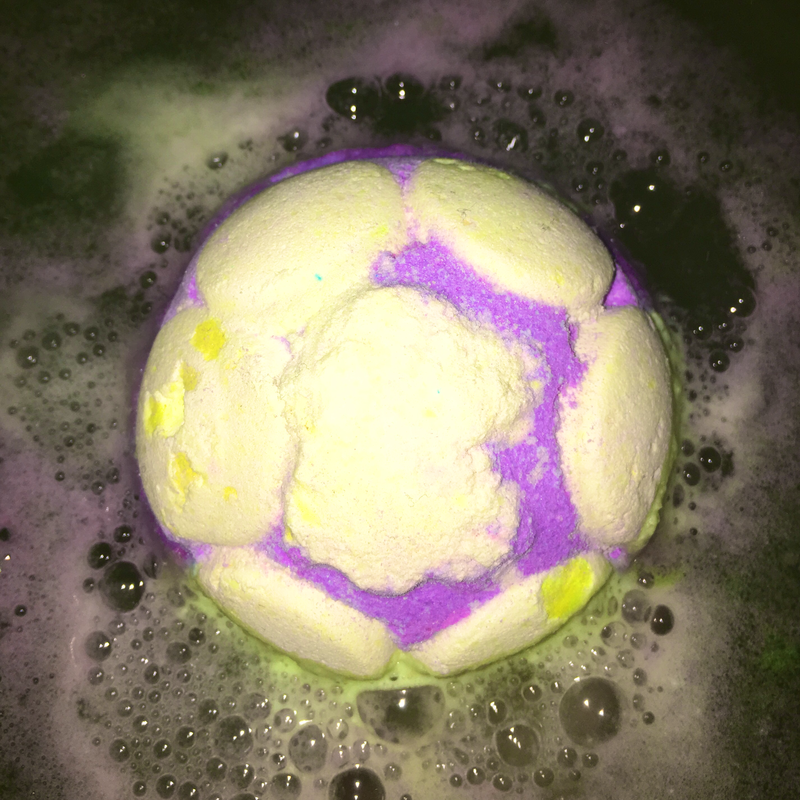 I recommend trying the jelly bombs with as hot as you can stand it water, just like the Butterball bath bomb it performs better the hotter the water. Pushing the leftover lumps aide, everything else about this jelly bomb ticks my boxes for a good Lush product. Once you’re out of an Ectoplasm bath your skin feels fabulous, I’ve said it before and I will say it again, the effect the seaweed based sodium alginate ingredient has on your skin (the ingredient that creates the jelly like substance) is like nothing I have experienced in a cosmetic product before. The Lush jelly bombs are a game changer in regards to skincare, even after a day has passed, your skin still feels soft, smooth and fabulous after sharing a bath with a jelly bomb. Ectoplasm’s scent stays with you throughout your bath. Once you get out it remains on your skin for a few hours too. Before I forget, I want to point out that the jelly it creates dissolves into just bath water after a short time, I have mentioned it as this is a question everyone keeps asking me. Overall I am very impressed with this jelly bomb, I have my fingers crossed that it is a part of the Halloween range this year and that hopefully by then they may have improved the recipe in some way so that we don’t get as many lumps hanging around at the end.